The Slice™ Safety Cutter is the most versatile tool you'll ever own. The Slice™ Safety Cutter features a finger-friendly microscopic ceramic blade that's quick, easy and a safe substitute for scissors. Perfect for scrap-booking, clipping recipes, coupons and news articles, removing shrink-wrap, opening CDs, DVDs, and plastic packaging, and more. Includes a built-in magnet and key-ring hole. 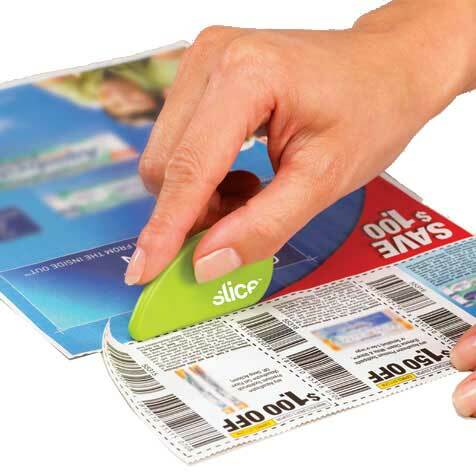 I LoVe the Slice™ Safety Cutter because it is easy to carry in your purse so you can easily cut coupons at the store. That makes it easy for those of us into Extreme Couponing to work our Coupon Binders while we are in the midst of Shopping. My daughter LoVes using the Slice™ Safety Cutter for Scrapbooking! It saves her a ton of time and lets her make a ton of cool designs quickly. It's also great because the Slice™ Safety Cutter is safe for the kids so they can help with all the busy work and you can spend your time designing each page and enjoying the fun side of Scrapbooking! 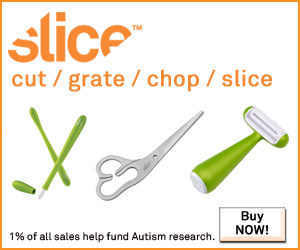 Please note that a portion of all Slice™ product sales is donated to help fund Autism Research.